Continuamos con “Mi PATSY WALKER ideal”, un ejemplo más de que Warren Ellis es genio y figura. Cuando este escritor se propone teorizar sobre lo que le conviene al superhero comic, nos regala algo más allá de un fan fiction: pedazos de literatura sumamente mordaces, irónicos, superlativos, dignos de estudio y seria consideración. ¿Por qué no se me ocurrió esto a mí? “PATSY” es un sueño febril de ficción especulativa y (peligrosa) aproximación al comic perfecto, confeccionado y teledirigido al consumo masivo. ¿Estás listo, true believer? Tony Isabella’s recent Back To ’67/’68 poll placed an idea in my head. Rather than choosing creative teams for an old Marvel schedule… if you were *running* these books, what would you do with them? What would they be about? What tone would they have? How would you change the history of the comics medium in America? It’s 1968. Stan Lee is dead, lost to the world in a bizarre plumbing accident. You have purchased Marvel Entertainment Group with drug money. Editors tremble at the sound of you repeatedly ratcheting your automatic pistol, alone in your office. Strange women move through the editorial floor at odd hours of the day and night, rubbing white powder from their elegant noses and using the office photocopier to run off endless grainy monochrome images of the trackmarks on their slim white arms. You are obscenely rich, blisteringly mad, unpredictably violent, and very much in control. What do you do? WHAT DO YOU DO?!? Easy. You cancel everything but the “model” comic for girls, PATSY WALKER. The excesses of Warhol’s Factory are still fresh in everybody’s mind. The title has that cold, elegaic quality of British “kitchen-sink” drama. You track down the surviving Factory crowd, dragging a writer behind you. You find Ultra Violet, probably the most literate and sane of the Warhol Superstars. You start talking. And after a while, you start listening. You go back to the office, and you begin working, to find a way to capture the bleak glamour of the New York fashion and art crowd. This isn’t going to be like your other comics. Cocaine and hubris have lit a flame in the methane-reeking cesspit of your mind. Oh, no, this is going to be something different. You talk to your writer about throwing out the conventions of the girl’s comic form that PATSY has followed to date. You start talking about *real* writers, about Mailer and Wolfe and all the others. You go to your production people, and start discussing ways to produce a comic that doesn’t look like a comic. You want it to look like a *book. * Regular comics size and page count, but the cover design needs to be radically different. The Marvel logo is reduced down to a small mark, as is the price tag. You hire an artist to produce painted cover art in a realist style. 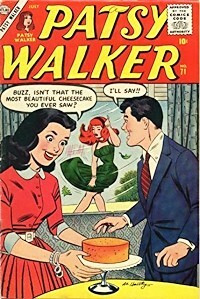 You’re going to take your guts in both hands and make PATSY WALKER into a book about the real life and lifestyle of the modern model, in appalling, crushing detail. You’re going to tell stories of drugs and pain and humiliation and contempt and beauty, in an unembellished, unexaggerated way. And you’re going to aim it at an adult readership. Crucially, you will not offer it to the Comics Code. 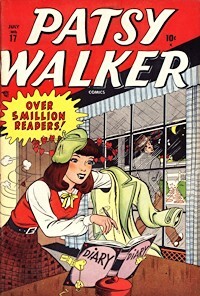 You will, instead, make a cause celebre of it; you will find any famous person capable of reading and you’ll make the bastards stand up and tell the country why PATSY WALKER should be read. The easiest way to do this, of course, is by hoaxing — “My God, Mr/Ms Whoever, that evil dogf*cker Nixon and his drooling lapdog Agnew are determined to kill this brave step for a new medium! If they get us, don’t you think you’ll be next? Hell, yes, they’ll have the taste for blood, they’ll go after print, and then you’ll see the Hayes Act come back…” It works almost too well. You set up the CCA as evil, fossilised authority figures before the book’s even submitted to them, make them a new bogeyman against Art. You get the literati going. Burt Lancaster does TV spots funded by the ACLU in which PATSY is cited as “the breakthrough for an important new American artform.” ROLLING STONE’s all over you like a rash. 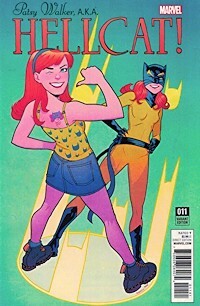 Everyone under thirty wants to read PATSY WALKER — and, in fact, older academics and pundits proclaim the book to be an outstandingly moral and compassionate work. In an unprecedented “trade paperback” collected form, PATSY successfully establishes a solid beachhead for large comics works in bookstores. Right up until Valerie Solanas walks into the office, everything is wonderful…. Comics de superhéroes como “Ms. Marvel” (Marvel 2014, un coming of age para una jovencita pakistaní en Jersey City), “Alias” (Marvel 2001, stream-of-consciousness detectivesco), “Batgirl” (DC Comics 2015, una aventura para Jóvenes Adultos con elementos temáticos propios de la cultura millennial), “Black Canary” (DC Comics 2015, soap opera con tintes de ansia juvenil, ciencia ficción, ultraviolencia y melodrama) y “Mockingbird” (Marvel 2016, superheroína feminista en aventuras contra el Patriarcado), son ejemplos selectos que siguen estas reglas de reinvención del “PATSY WALKER” de Warren Ellis.